Coconut milk is derived from the flesh of the coconut. It is not the liquid that can be drained out from a coconut that has been punctured, although many people assume this. Getting coconut milk from a coconut requires some processing, but the ingredient is also available in cans or bottles. Coconut milk is used as a cooking base in many recipes, particularly in the cuisine of Thailand and other South and Southeast Asian countries, but also in West Africa, Hawaii and the West Indies. When a coconut is cut open, the flesh can be found all along its inner walls. A ripe coconut, ideal for processing into coconut milk, should have thick, creamy white flesh. If the flesh appears yellow, it is most likely rancid. A coconut with relatively thin, dry flesh can still be used to make milk, but the milk may not be creamy enough for certain recipes, particularly curries. To make coconut milk, the coconut flesh must be finely grated and steeped in hot water. Next, the soaked pieces are squeezed through cheesecloth, and the liquid collected is coconut milk. This process may be repeated once or twice to produce lighter coconut milk, as different consistencies are required for different recipes. When the first pressing is allowed to sit for a while, coconut cream rises to the top. This ingredient is commonly used in desserts or rich sauces. Canned and bottled coconut milk varies widely in quality, and most cooks have their own preferences. However, in general, a quality product will have a layer of thicker cream on the top and thinner milk on the bottom. The can may be shaken to produce a more uniform coconut milk if desired, or the cream may be removed and used for something else. Coconut milk must be refrigerated if not used immediately, as it will spoil otherwise. While coconut milk is high in saturated fat, it is much healthier than other saturated fat products, and the fat is easily metabolized by the body. Coconut milk also offers some particular health benefits. It is anti-carcinogenic, anti-microbial, anti-bacterial, and anti-viral. The main saturated fat that it contains, lauric acid, is also found in mother's milk and has been shown to promote brain development and bone health. Some hope that coconut milk, with its powerful anti-viral properties, can one day be used in the fight against AIDS. Coconut milk is immensely rich in vitamins and minerals. Coconut milk contains high levels of some of the crucial minerals like, iron, calcium, potassium, magnesium and zinc. It also contains a significant amount of vitamin C and E. One cup of coconut milk (about 240 gm) contains 13 gm carbohydrates, 5 gm fiber, 5 gm protein and 57 gm fats, mainly saturated fats. One cup of coconut milk can provide about 552 calories, which means that coconut milk is high in calories and hence, should be consumed in small amounts. The fat content of coconut milk is also very high, which too highlights the importance of taking it only in small amounts. Apart from these, one cup of coconut milk also contains about 6.7 mg vitamin C, 0.4 mg vitamin E, 0.2 mcg vitamin K, 1.8 mg niacin, 38.4 mcg folate, 0.1 mg vitamin B6 and 0.1 mg thiamine. The same amount of coconut milk can give about 38.4 mg calcium, 3.8 mg iron, 88.8 mg magnesium, 631 mg potassium, 240 mg phosphorus, 1.6 mg zinc, 2.2 mg manganese, 0.6 mg copper and 14.9 mcg selenium. A major part of the fats found in coconut milk is lauric acid, which has been found to exhibit antibacterial, antifungal and antiviral properties. This fatty acid can boost the immune system and its disease fighting ability. Lauric acid can also be helpful in maintaining the elasticity of the blood vessels and in keeping them clean, which can lower the risk for conditions like, atherosclerosis and heart disease. Coconut milk also contains several antioxidant compounds, which can provide protection against the harmful free radicals and their damaging effects on the body cells and tissues. Coconut milk can improve the health of the digestive system and promote digestion. It can relieve the symptoms of stomach ulcers and acid reflux disease as well. Coconut milk can give about 22% of the recommended daily allowance of iron. With such a high level of iron, it can help to treat anemia caused by iron deficiency. Apart from these, coconut milk may help to relax the nerves and the muscles, control blood sugar level, lower blood pressure and reduce joint inflammation. Coconut milk can have benefits for hair as well. In fact, it is increasingly used for hair care of late. It contains vitamin E and fats, which can prove effective in moisturizing hair. Fresh coconut milk can nourish hair and promote hair growth. It can be used for controlling excessive hair fall as well. Along with hair care, coconut milk can be used for skin care as well. It can be used for cleansing the skin pores by removing dirt and excess sebum. When used for skin care, coconut milk can give soft and supple skin and a radiant complexion. Coconut milk can also remove the dead cells from the skin by acting as a gentle exfoliating agent. At the same time, it helps to keep the skin well hydrated and moisturized as well. The aforementioned information should now help you understand that the relationship between coconut milk and health is a good one, as well as various benefits of coconut milk for hair and skin care. This nutritious milk can be consumed safely by people who are lactose intolerant or have allergy to cows' milk. Coconut milk is also soy and gluten free and so, people allergic to such substances can also use it. Doctors recommend coconut milk for health. 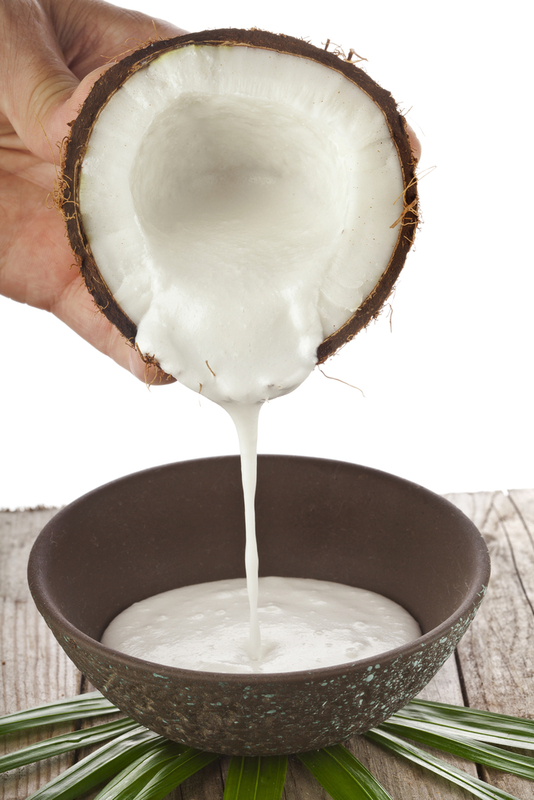 Coconut milk health benefits are mentioned in Traditional Medicine for the human body. It is also used for the treatment of mouth ulcers. Coconut milk has many minerals, vitamins and electrolytes such as calcium, potassium and chloride. Coconut is a dairy free alternative to those who are lactose intolerant and are also allergic to animal milk. This milk is also nut free, soy free and gluten free. It is good for the health of your skin and hair. Many cosmetic giants use it as a base in products for skin and hair. Apply coconut milk to the scalp to have dandruff free hair and condition your hair naturally. Coconut milk is a reservoir of antioxidants. Antioxidants help the body fight aging, low vision and low bone density. It also aids in digestion and is also used as a laxative. It can also be a remedy for urinary and kidney problems. If your skin has been exposed to the harsh rays of the sun for a long period and this has caused a rash or a sunburn; coconut milk is an instant healer. Have a bath in coconut milk or apply the milk to the rash and leave it overnight; the milk has cooling properties that will help get rid of the dryness and itchiness of the rash. Wash it off in the morning with cold water. Coconut milk is an excellent source of Vitamin E. It helps in the nourishment of the skin. You benefit from it in both ways by consuming or by applying the milk to your skin. These fatty acids are quickly converted in to energy instead of storing as fat in the body. Lauric acid is anti fungal, anti viral and anti microbial. Coconut milk helps to boost your immune system. Lauric acid present in coconut milk, helps to keep the arteries of the heart clean and healthy. The sugar content of coconut milk is high. One glass of coconut milk fulfills the sugar need of the body.